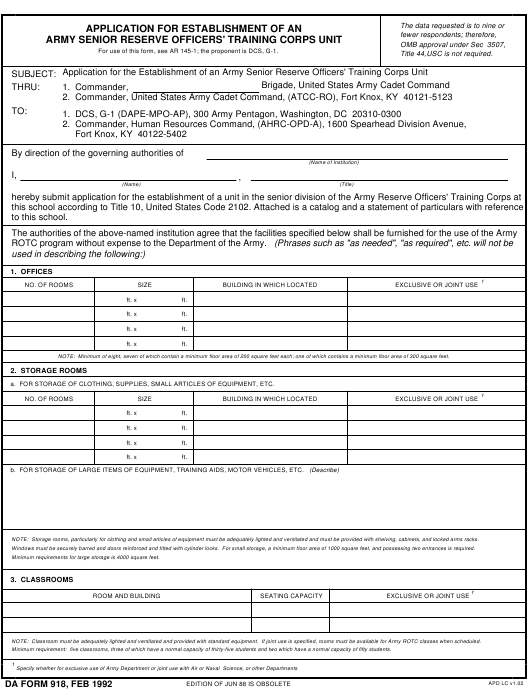 DA Form 918 - also known as the "Application For Establishment Of An Army Senior Reserve Officers' Training Corps Unit" - is a Military form issued and used by the United States Department of the Army. The form - often mistakenly referred to as the DD form 918 - was last revised on February 1, 1992. Download an up-to-date fillable PDF version of the DA 918 below or request a copy through the chain of command. For use of this form, see AR 145-1; the proponent is DCS, G-1. Title 44,USC is not required. NOTE: Minimum of eight, seven of which contain a minimum floor area of 200 square feet each; one of which contains a minimum floor area of 300 square feet. a. FOR STORAGE OF CLOTHING, SUPPLIES, SMALL ARTICLES OF EQUIPMENT, ETC. NOTE: Storage rooms, particularly for clothing and small articles of equipment must be adequately lighted and ventilated and must be provided with shelving, cabinets, and locked arms racks. Windows must be securely barred and doors reinforced and fitted with cylinder locks. For small storage, a minimum floor area of 1000 square feet, and possessing two entrances is required. Minimum requirements for large storage is 4000 square feet. NOTE: Classroom must be adequately lighted and ventilated and provided with standard equipment. If joint use is specified, rooms must be available for Army ROTC classes when scheduled. Minimum requirement: five classrooms, three of which have a normal capacity of thirty-five students and two which have a normal capacity of fifty students. forms in the original and four copies and keep one copy of each form for institution files.